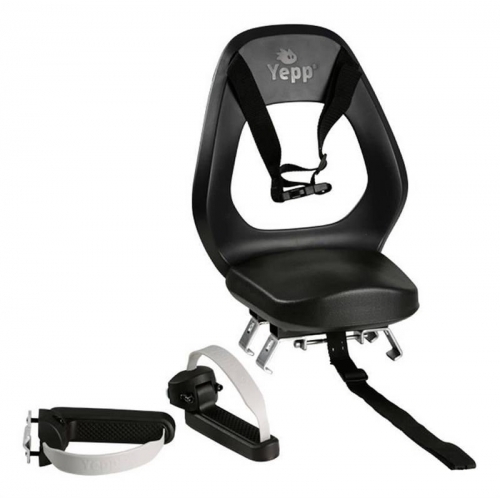 The Yepp Junior Budget child seat is intended to accommodate children who are a little too large for traditional "baby" child seats. The target age range is 6 to 10 years of age. Note the 22 kg and 6 year age minimums and 35 kg maximum weight limit for the child and the weight limit for the rack on your bicycle to which the seat is fitted. Fits on racks between 11 and 17 cm wide with tube diameters between 13 and 16 mm. Use only rear racks which are specified as being able to take a weight of 35 kg according to EN14872 / ISO11243. This is an easy hop on / hop off child seat, with a hip strap, not a full five point harness as used on child seats for younger children. This seat also has a rear reflector and foldable foot pegs. We strongly recommend using the GMG Yeppie foot protector to prevent the chance of a child's feet going between the spokes of the rear wheel. We also recommend a good double stand. See our range of stands. As with all products for transporting children, it is very important that this seat is fitted correctly to ensure the safety of your child. 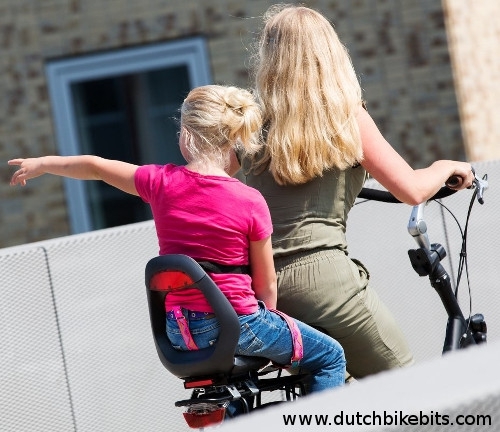 This seat is used by thousands of parents in the Netherlands and is safe if correctly installed on a suitable bicycle. We supply the parts but we cannot take responsibility for the installation of the seat on your bicycle. If you are not absolutely certain of being able to install this seat correctly yourself please ask for help from a local cycling specialist who can ensure it is safely installed. Read the instructions and warnings shown in the additional images before buying and read the instructions supplied before installing on your bicycle.